I've seen these at Target and TRU locally as well, but just Wave 1 of the basic line so far (along with deluxe, vehicles, role play, etc.) I grabbed the "regular" Cap (I believe it is called "Heavy Artillery" Captain America), since the Marvel Universe ones so far have been pretty much Ultimates-styled. Nice figure. I don't know how much of the line I'll end up buying (or that will make it to retail, always tough to tell with movie lines), but it is kind of a neat line. Some nice deluxe, and that larger vehicle. Sure, it isn't comic (or movie I'm guessing) accurate, but I'm sure kids could have fun with it. Saw these for the first time today... at least what was left. My local WM only had two winter Caps (the one with the white coat) and a few deluxe figures. I really only want the "normal" Cap so I'll patiently wait for restocks... you know they're coming in full force. I find it interesting that the deluxe figures are $9.99 in this line, yet the Thor deluxe figures are $2-$3 more depending on where you shop. You seem to get more out the Captain America deluxe offerings too... weird. That's Hasbro for ya. Captain America Deluxe figure lack any swivel arm joints. So much for "deluxe". And they pulled the Iron Man/Spiderman bit with the jeep-type vehicles, too. Both include Captain America figures as poseable as a 1978 Kenner Luke Skywalker. I'm not really surprised, just disappointed that this is from the company that made GI JOE, where every vehicle driver (except Deep Six) was as moveable as a regular figure. What is the "best" CA figure, to everyone? 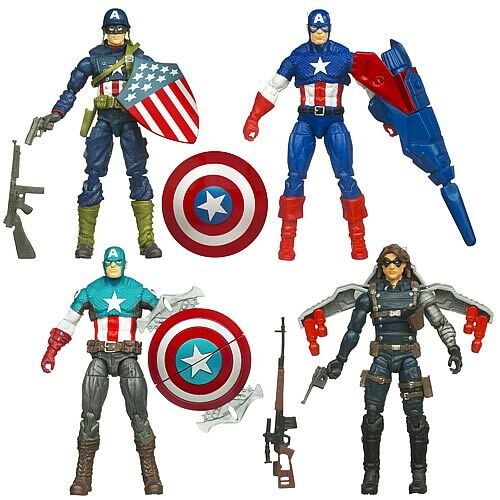 I'm really wanting one just for with my WW2 figure shelf for fun, and I was thinking the one with the web gear and a Thompson was best, but I'm not real familiar with what all CA's they're putting out either. Just was curious if there's something better than that? All the ones I saw had horrific eye paint aps. Blah. The 1st one is the comic version, the 2nd one is the movie version. Funny story though, I've always loved Marvel. When the 6" Marvel Legends started coming out, I passed because I wanted to stick to 3 3/4" scale. Then when the this scale started coming out 3 years ago, I said I was going to just stick to Star Wars. Then one day I picked up Wave 1 Iron Man. Then Captain America. 3 years later, I have 2 x 8 foot shelves loaded with 3 tier displays of Marvel figures in this scale. I gotta post pics of this one of these days, it probably is the coolest part of the over 80 feet of such shelving I have figures displayed on. The upper right of the top pic is the best classic Comic version of Cap to date. It still isn't perfect but it is pretty swell. As it turns out it's way too short compared to the other figures, the head likeness is off too. The 2 WWII versions of Cap are great though, Crossbones is great, Bucky as Cap (Heroic Age) is awesome too. p.s. U.S. Agent is a fine figure as well. Red Skull is okay I still prefer the SDCC '09 version by a lot. Agreed, the best could have been the first Secret Wars comic pack version w/ Klaw. They totally screwed the pooch though on the final product. Is that movie one (the bottom pic one) out yet? I haven't seen it, just the one in that top pic. I like that movie one a LOT more, and it'd go better with realistic military figures IMO. Yeah it's a little harder to find for the moment, but I actually have a spare one in my possession if you want it. I got the Wave 2 case from EE. PM me for the shipping arrangements if you want it. That's ok, but thanks Matt. I'll just keep my eyes open for it while I'm out and about... It was just something I wanted on a whim, not something I'm desperate to get (at least not yet). I'm assuming he'll be easy to find at some point or another since the line is pretty brand new. He looks pretty badass, and I just want him for with my US Soldiers for some reason. Think he'd look cool standing in front of a bunch of them. Dressel, is the Thor in wave 2 with the helmet the same as the wave 1 figure without it? Is the helmet removable on that figure? the helmet is not removable, and it seems the chain mail armor is a lot darker.